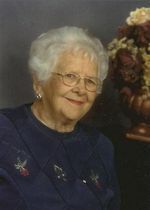 Rosa E. Strickling, age 99 of Ashland, OH., passed away Monday, October 5, 2009 at Hospice House of North Central Ohio. On November 22, 1909 in Milton Twp., Ashland Co., OH., Mrs. Strickling was born to the late John and Katherine (Malching) Wertman. She had been a resident and homemaker in Ashland Co. all of her life. Formerly she was employed at Ashland Rubber and Doormat Co. Mrs. Strickling was a member of Peace Lutheran Church, the Faith Circle Bible Study, Milton Neighbors, a volunteer with the American Red Cross, attended school at Roland School as a child, and enjoyed gardening and sewing. On March 11, 1933, Mrs. Strickling married Roy Strickling who preceded her in death February 28, 1997. Surviving Mrs. Strickling are 2 daughters: Shirley Null of Ashland, OH, and Nancy (Gerald) Johnson of Ney, OH. ; 1 son, Frank (Judy) Strickling of Ashland; 5 grandchildren; and 12 great-grandchildren. She is also preceded in death by 5 brothers: Karl, Tully, Emmet, Henry, and Lewis; and a sister, Anna. Services will be held 11:00am Friday, October 9, 2009 at Peace Lutheran Church, 1360 Smith Rd., Ashland, OH., with Pastor Virginia Pflueger officiating. Interment will be at Ashland Co. Memorial Park. Friends may visit with the family Thursday evening 6:00 to 8:00 pm at Heyl Funeral Home, 227 Broad St., Ashland, OH., and 1 hour prior to the service Friday at the church. The family suggests memorial contributions may be made to Hospice of North Central Ohio, 1050 Dauch Dr., Ashland, OH., 44805.